The CD22 antigen (BL-CAM) is a transmembrane glycoprotein of the immunoglobulin superfamily. It may be expressed as two different isoforms: the α form (130 kDa) and the β form (140 kDa). It is a B lineage restricted antigen that occurs in the cytoplasm of early B cell precursors and pre-B cells and on the cell surface of resting and activated B cells. 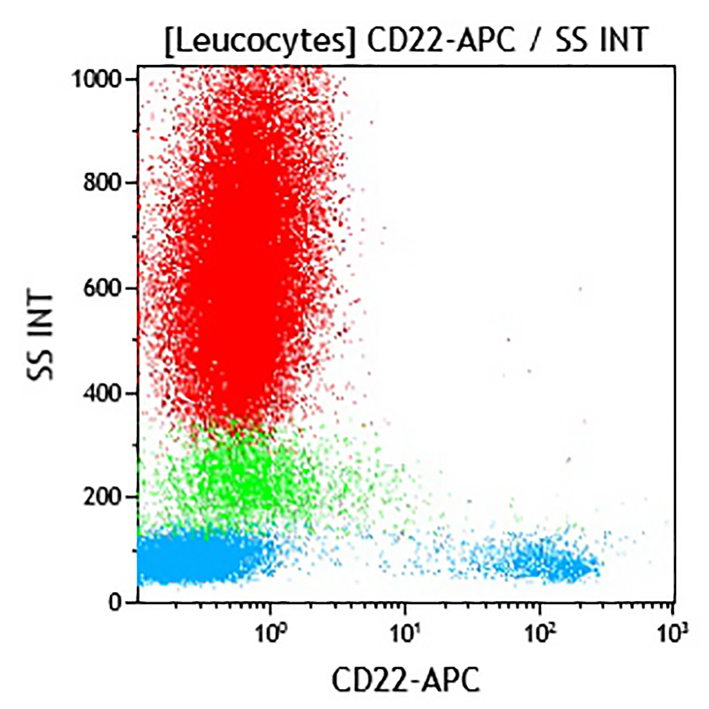 The CD22 antigen is absent from peripheral blood T lymphocytes, granulocytes, monocytes. It is expressed on less than 1% of bone marrow mononuclear cell and 50% of Epstein Barr virus transformed lymphoblastoid B cell lines. CD22 demonstrates heterogeneous expression on resting peripheral blood B lymphocytes. The antigen is lost following activation of B cells with a variety of mitogens. The CD22 molecule regulates signal transduction through the B cell receptor. It is a receptor for certain sialic acid containing glycoproteins.